Happy Thursday Quick Quotes friends! 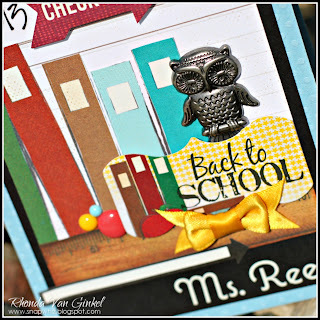 It's Rhonda here today to share a clean and simple back to school card with you. I've used the all new "Pattern Perfect" collection for this project. The books and ruler strip were cut and layered onto the white lined paper. I arranged the mat so it has the appearance of a polaroid frame and I added the teacher's name to the bottom corner using alpha rub-ons from my stash. Thanks so much for joining us here today on the blog for a moment. Have a fantastic day! Love the new line, perfect for school projects, this is such a cute card! What a super teacher card!!! Like the Owl charm. My daughter likes Owls. This card is darling!!! I am a huge fan of owls and this one looks fabulous on your card! !